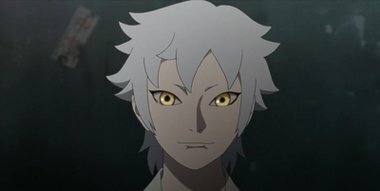 A student named Mitsuki has transferred into Boruto's class from Hidden Sound Village. He overwhelms Iwabe in sparring and shows his genius by solving difficult problems. However, Boruto and the others are unable to tell what he is thinking. Meanwhile, someone who has been doing repair work on the school suddenly goes berserk. Boruto and the others rush over. Another side of Mitsuki emerges as he starts muttering strange words.